Bushnell 731422AP Trophy 1.75-4x32 Amber-Bright Circle-X Reticle Riflescope 731422AP FREE SHIPPING! This Bushnell Trophy 1.75-4x32 riflescope is designed for superior hunting performance. 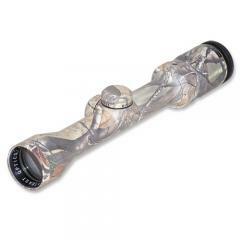 Its durable one-piece aluminum alloy tube features an advanced camouflage pattern, allowing it to blend into natural surroundings for enhanced concealability. Your target, on the other hand, will have no place to hide thanks to an Amber-Bright lens coating that enhances contrast, making it easier to spot them against a similar-colored backdrop. Its fingertip-adjustable windage and elevation controls make it easy to set up the perfect shot. The tube is O-ring sealed and filled with nitrogen gas to keep water out and prevent fogging, making it suitable for all weather conditions. ©2002-2019 CopsPlus.com: Bushnell 731422AP Trophy 1.75-4x32 Amber-Bright Circle-X Reticle Riflescope 731422AP FREE SHIPPING!